The theory that bigger is better in financial services is spurring a wave of mergers in the industry.The latest example is Torontobased Manulife Financial’s all-stock takeover of Boston’s John Hancock Financial Services. The $11.1 billion deal is the biggest in the insurance industry since American International Group acquired American General for $23.4 billion in 2001. The Manulife merger with John Hancock will create the second-largest life insurance company in North America behind AIG. 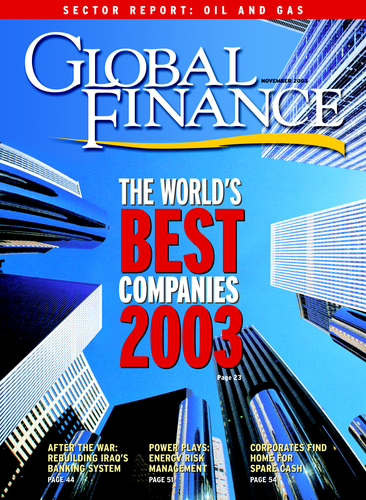 Announced mergers in the financial services industry totaled $156 billion in the first three quarters of 2003, making ‘financials’ the leading sector for worldwide M&A; in the period, according to Newark,New Jersey-based Thomson Financial.That period’s increase of 41% in financial-related deals compared with the first nine months of 2002 comes at a time when overall announced M&A; volume is still declining from yearearlier levels. Manulife’s Dominic D’Alessandro, who will be president and CEO of the combined entity after the Hancock takeover, says the deal will create a global leader with the scale and capital base to grow more quickly. The combination of Hancock’s Asian businesses with Manulife’s operations in Hong Kong, China, Japan and Southeast Asia will result in one of the most extensive lifeinsurance franchises in Asia, according to company officials. State-controlled France Télécom agreed to acquire the remaining 13.7% stake it did not already own in mobile-phone services provider Orange, in a stock-swap transaction valued at $7.8 billion. Heavily indebted France Télécom is offering 11 of its shares for every 25 Orange shares. The mobile-phone operator is generating increasing amounts of cash flow, which will help France Télécom to pay down its $54 billion debt. France Télécom returned to profitability in the first six months of 2003 and plans to reinstate its dividend in 2004. The company was rescued from a debt crisis with government help last year. By fully consolidating Orange on its balance sheet, France Télécom will be able to benefit from huge deferred tax credits at the mobile-phone company, analysts say. France Télécom is buying out the minority shareholders in Orange less than three years after it floated the stake. Taiwan-based Fubon Financial Holding plans to launch a tender offer to acquire Hong Kong-based International Bank of Asia, a majority-owned unit of Arab Banking. Richard Tsai, Fubon’s cochief executive, says the deal is an attractive opportunity to expand into the Hong Kong financial services industry. Fubon’s ultimate objective is to enter the larger Chinese market. “Our strategic objective is to become one of the leading diversified personal financial services companies in the Chinesespeaking world,”Tsai says. The Closer Economic Partnership Agreement signed by China and Hong Kong in June gives preferential treatment to Hong Kong banks interested in setting up branches on the mainland. Fubon, which is 11% owned by Citigroup, is Taiwan’s fifth-largest listed financial group in terms of assets.